The culinary industry provides about 458,500 jobs for residents of North Carolina, accounting for about 12% of employment in the state. The culinary industry is booming, with 67,900 jobs expected to be added by 2016 (an increase of 14.8%!). Those looking to enter the field need to make sure they have the proper credentials to achieve their goals. A certificate or degree from a top culinary school can make those dreams happen. 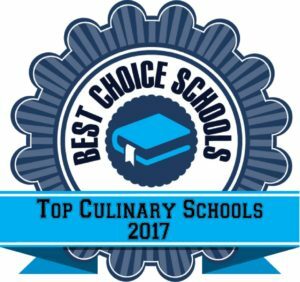 We developed a list of the top 10 best culinary schools in North Carolina. Schools were included in our list who provide students with hands on learning opportunities, practical work experience, experienced instructors, and have a positive reputation in the field based on our research. Many schools on our list are accredited by the American Culinary Federation, with some programs earning exemplary status indicated academic rigor. Alamance Community College is a top culinary school preparing students for a wide variety of culinary positions in various venues including resorts, clubs, hotels, and restaurants. Coursework covers a variety of areas such as baking, garde manger, nutrition, customer service, and human resource management. Students are taught about the importance of environmental stewardship, professionalism, and culinary standards. The AAS degree can be completed in just two years and students will be prepared to work in entry level positions such as prep cook or station chef. Lenoir Community College in Kinston, North Carolina features an AAS Degree in Culinary Arts that can be completed in just two years. Students also have the opportunity to earn a diploma or certificate in culinary arts as they work toward their degree. Certificate programs are 14-16 credit hours and cover basic culinary courses such as sanitation, nutrition, and purchasing. The diploma program is a 39 credit hour program that offers a greater variety of coursework including culinary skills and work-based learning. The AAS degree program features courses such as Farm-to-Table, Global Cuisine, and Menu Design. Work based learning is also a featured component of this program. Wake Technical College is a top accredited culinary school with one of the lowest student faculty ratios among culinary schools. Students receive individualized attention in lab courses that have a ratio of 12:1. Students have the opportunity to begin the program at any time since entry level courses start each semester. Courses are offered during the day as well as the evening to accommodate busy scheduled. Instructors are experienced professionals in the field both as culinary experts and educators. Students have the opportunity to join the American Culinary Federation North Carolina Chapter to take advantage of professional development opportunities and networking. Central Carolina Community College features an exciting culinary arts program for those looking for a program focused on sustainable practices and practical application. A low student/faculty ratio of 10:1 ensures that students will receive individualized attention and communication from instructors. The program is also offered as a Fast Track Program, allowing students to complete in just one year. For students who plan to continue their education at a four year institution, an articulation agreement is in place with Johnson and Wales University. Several student operated restaurants are located on various campuses of CCCC. The Cougar Café features a short order menu and is open during the school year. Natural Chef Café is another dining option located on the Pittsboro Campus and offers sustainable meals that use local farms to supply ingredients. Menu selections may include gluten free, vegan, or vegetarian dishes. The International Culinary School At the Art Institute of Charlotte features culinary degrees at all levels in a state-of-the-art learning environment. Students learn a variety of professional skills including cost control, sanitation, kitchen management, and beverage management. Students have the opportunity to explore both classical and international cuisine preparation. Graduates are prepared to be successful culinary team members in a variety of commercial culinary settings. The Greensboro Culinard Culinary Arts program offers both a Certificate in Baking and Pastry as well as a Certificate in Culinary Arts. Students have the opportunity to complete one or both certificate programs. Culinard is accredited by the American Culinary Federation. Culinary Arts students can complete their Certificate in just 36 weeks. The program is hands-on and provides an intensive educational experience in food preparation. Students complete an externship opportunity during the program to earn professional experience. The Pastry Arts Certificate can be completed in an additional 24 weeks, or as a stand alone program in 36 weeks. Students also receive hands-on instruction and are actively working in the kitchen from the start of the program. Guilford Technical College features an AAS Degree in Culinary Technology that has been awarded exemplary status by the American Culinary Federation. A certificate and diploma program are also available. The Diploma Program can be completed in three semesters and covers courses in culinary skills, nutrition, food and beverage services, and baking. Students spend time in the lab practicing their technique. The Certificate Program can be completed in just two semesters and includes basic coursework to meet the needs of those just starting out. The Associate Degree program can be completed in two years and has received exemplary status from the American Culinary Federation. Students have the opportunity to engage in work based learning in their final year of the program. The program features a good blend of classroom and laboratory instruction. The Art Institute of Raleigh-Durham offers an exciting variety of culinary programs that are newly accredited by the American Culinary Federation. The program has received attention for its student operated restaurant, The District at 410. Students have the opportunity to prepare and serve meals to the public in a fine dining setting. In 2015, culinary students had the opportunity to work with the touring chef for the Rolling Stones to feed the crew. Students created a giant guitar sculpted from sugar and Rolling Stones themed cookies. These exciting opportunities are just part of what students at the Art Institute of Raleigh experience as part of the program. Coursework includes both American and international cuisine and students use ingredients from around the world. Graduates are well prepared to accept entry level positions in commercial culinary settings. Central Piedmont Community College features an AAS Degree program in Baking and Pastry Arts as well as an AAS Degree program in Culinary Arts. Several specialized Certificates are also available in Baking and Pastry. The Culinary Arts program has been awarded exemplary status by the American Culinary Federation. Students are engaged in a state-of-the-art kitchen facility and experience classroom and lab instruction throughout the program. Small class setting provides individual attention. Baking and Pastry students have the opportunity to earn a Bakery and Pastry Certificate in several different areas of specialization including Cake Artistry, Dessert Artistry, Chocolate and Sugar Artistry, and a brand new specialization in Cake Decorating and Design. Students can earn these certificates on their way to earning their AAS Degree. Asheville-Buncombe Technical Community College is a top culinary school offering programs accredited by the American Culinary Federation. A-B Tech has a solid industry reputation with the Culinary Team ranking 2nd in the country in 2013, a 2012 graduate named the Best Young Chef in the World in 2012, and in 2007 winning the American Culinary Federation Student Culinary Competition. Students receive a hands-on education with access to five state-of-the-art kitchen labs with modern equipment and the ability to view chef demonstrations in a modern demo kitchen. An on-campus restaurant provides students with the opportunity to apply their culinary skills in a professional setting. Students can also complete their degree in Brewering, Distillation, and Fermentation. Classroom and lab instruction are both part of this innovate degree program.